Are you looking for garment buyer's list? Here is a BIG list of international garment buyers and brands - from the USA, and European countries. This list of buyers are collected from internet, from the exporter's client list, and collected from friends. Apparel manufacturers and exporters across the globe manufacture millions of garments every day. These garments are purchased by the apparel retailers, brands and apparel buyers and finally reaches the end consumers who live far away from the manufacturers. As a garment manufacturer, one needs business opportunity from apparel retailers. They need to know about the top and popular apparel buyers and brands to expand their market reach. Some of these buyers are retailers having stores in across the globe, some have stored in their home countries (but the country name may be listed for one country). 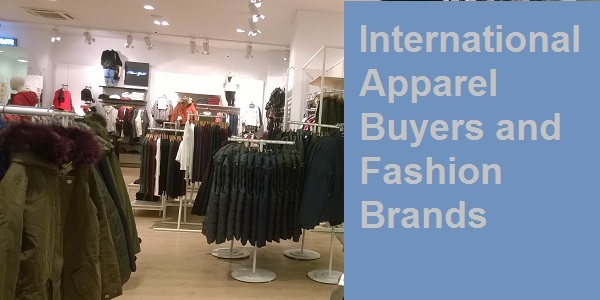 Some retailers have a number of apparel brands under a group for the different niche. You can research more about the buyer by visiting their website. In case you find any mistake in the above list you can mention it. Secondly, if you see some well-known brand is missing please write the name in the comment box for addition. A master list of international garment buyers and brands. Get buyers website url and country name.